» Albany downtown: The riverfront next? 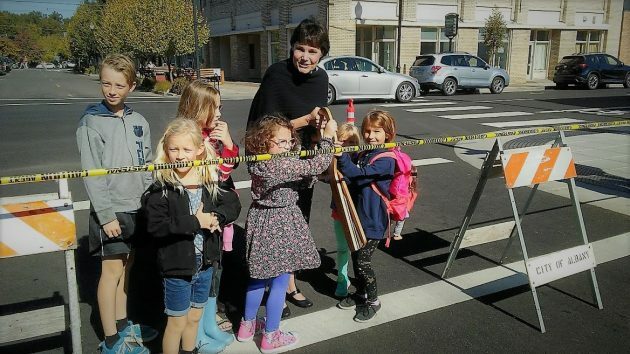 Albany Mayor Sharon Konopa had several helpers Saturday in cutting the ceremonial ribbon to mark completion of the downtown streetscape project. Water Avenue has long been in CARA’s sights. The 1995 study that laid the groundwork for the revitalization district focused on the Willamette riverfront as one of the central city’s main assets. That study, done while the “Willamette Queen” riverboat was still based in Albany, envisioned a pier and boat dock, among other things. Some years later the council commissioned a study of how Water Avenue might be improved from Washington Street to Main Street with new sidewalks, street lights and other things. I could write volumes about the folly of CARA’s “next move”, but I’ll instead comment on Konopa’s immoral use of kids in a political event. Political indoctrination is when a politician like Konopa manipulates a political event to indoctrinate a younger generation. Children cannot decide their true feelings on political issues like CARA until they are adults with skin in the game. That is why using children as political tools is so wrong. We can’t trust children to vote for good reason. So why make children the face of a CARA political event? Shame on the Mayor. Lighten up, Gordon. The mayor could hardly shoo those kids away after their parents urged them to go join her. And as for political? It was more like a civic occasion to mark the completion of a project that spruced up that part of town. Get serious, Hasso. This event was not civic in nature. Nobody voluntarily benefited the community by picking up trash. Kids weren’t taught about the importance of freedom. Nobody helped a charity. Nobody was encouraged to vote. No, this event was sponsored by CARA and led by a politician up for re-election next month – an inherently political event with all the trappings of power and money. This was a celebration of government debt creation and subsequent spending. If kids are going to be roped into such an event, it is our civic duty to be truthful with them about the nature of government and what it does best – take money from residents and spend it on arguably stupid things. If we can’t be honest about the reality of CARA and its political nature, we do these kiddo’s a giant disservice. Rant away Gordon, but start using ALL CAPS to show your rage. After all, you live on the east coast and it’s hard for people to hear your incessant outrage at Albany, way out here in Oregon. Gordon, we all know how you feel and know you can no longer be reasonable. Don’t they have somewhere for you to complain where you actually live? Maybe get off-line and out into the real world. That’s my kid, a resident of Albany. Worry about your own town Shadle. What….after smearing lipstick on the “downtown pig” to beautify it the mayor wants to spread some rouge around on the waterfront! Could this be in vain hopes of adding style & Victorian grace to this backwater area? The city spent thousands years ago on two piers that have since been completely silted in, docks removed and the area useless. The only people daring to use this water front after dark are the shiftless vagabonds that inhabit the night. That’s not true, James. I live close to the downtown waterfront and often go for walks down the newly lit waterfront sidewalk. I’m passed by joggers, couples, teenagers, people walking their dogs, etc. Even before they put the lights in, there was nothing wrong with hanging out at the riverfront after dark. You should give it a try sometime. Being afraid of the dark is kind of silly at your age. Maybe effort could be put into having all of the owners of the downtown buildings be responsible for their upkeep. Savannah, Corvallis, and many more cities turned their back on the once thriving lifeline of river commerce and travel. The rivers were the resource for the settlements to even become a city. This is a valid consideration to improve the riverfront. What a joy having a river running through this town. We can bring it back to life here in Albany with appropriate planning and spending. I feel that the riverfront is the reason our town came into being and deserves better treatment. Unfortunately, the railroad ruins the area even though it has no more downtown customers. I would love to see the RR rerouted to the UP tracks through our area and then we could see private development beautify this great oppurtunity. Mr Tripp, I anyone could make that happen-it would be you! What a great legacy. I’m wondering why we spent so much money on street lights in downtown Albany. There is nothing open downtown past 5:00pm. All hobby businesses close before it gets dark. The 3 or 4 places that may be open don’t justify the cost.